Most people are familiar with the French pointillist painting A Sunday Afternoon on the Island of La Grande Jatte (1884) by Georges Seurat in which millions of tiny dots depict elegant Parisians enjoying a sunny day along the banks of the River Seine. Indeed this fascinating painting contributes to the popularity of Gallery 240 at the Art Institute of Chicago where it is hung among kindred spirits Georges Lemmon, Paul Signac, Claude Monet and Henri-Edmond Cross (1856–1910). These artists, heavy hitters in the realm of color theory, may have all painted around the same time frame, but their approaches were quite different. Color and Light looks at the life and work of Cross comparing and contrasting different elements with his artistic simpaticos Seurat and Signac. 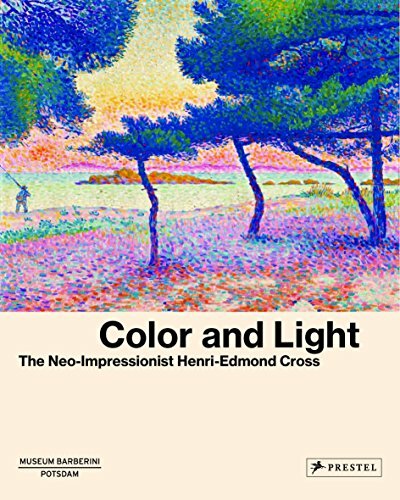 Over 200 paintings, drawings, and photographs combine with ten brief articles to culminate in this Color and Light catalog, produced in conjunction with an exhibition on display in the Museum of Impressionisms Giverny, France, and the Museum Barberini Potsdam, Germany. The catalog is organized to present thematic essays first. Topics of discussion include happiness, anarchy and Nietzsche, Cross’s experiences with Germany and Belgium, and Cross’ talents with drawing mediums. The second section pairs the catalog of exhibition works with four essays that cover the biographical chronology of Cross’ life. While all essays shed light on slightly different aspects of Cross’ personality, the catalog reads better if one actually starts with the biography section. Diving right into the origin of Cross’ popularity in Germany reads disjointed and out of order. By gaining a better understanding of who Cross was, and how his artwork changed, it is then easier to follow when drilling down into further specifics. No matter how one approaches their time with Color and Light, they will find a congenial voice, nothing too shocking or controversial, mostly because Cross himself was not one to ruffle many feathers. What he did ruffle up was his style. Similar to the dramatic changes van Gogh made to his canvas repertoire, Cross started out painting dark and traditional subjects in dark, traditional colors, from dark and traditional urban centers. Once he discovered color, and made a move to the coastal region of La Lavandou, again similar to van Gogh in Arles, his paintings burst with light and the “liberated” colors of the Mediterranean lifestyle. Which makes one wonder why van Gogh, who also met and was influenced by Signac, is not hanging in Gallery 240, nor is he mentioned in these pages to any great extent. With Neo-Impressionist techniques differentiated from Impressionist and Cross’ painting resembling van Gogh more so than Monet, squabbling over these categorizations is what livens up art history, as well as this catalog. Yet the heart of the discussion here is contained to Cross’ friends Seurat and Signac. Unique to Cross’ painting is the extent to which he did preparatory drawings, pastels and watercolors. The inclusion to the catalog of dozens of works on paper is thrilling to see. On paper Cross’ colors sparkle and dazzle, his compositions are electric, and there is a remarkable fresh feel even though they are over 100 years old. In them one can smell the sea air and not the musty paper. In many cases it is the water colors that prove Cross’ contribution to the modern art movement and maintain his continued relevance in contemporary discussions. Seeing them makes getting to know Cross as a person and an artist a true pleasure. Color and Light highlights the life and key artistic periods of a painter who participated heavily in moving color to a dramatic new level.